Craft Beer Rising is back for 2018, bigger and better than ever. Running from Thursday 22nd - Saturday 24th February at The Old Truman Brewery in Brick Lane, breweries (list here) will include Redchurch, Wild Card, Wolfpack Lager, Black Isle, and Maule, to name but 5, covering the UK, the Us and beyond. Tickets are £15 for Thursday, then £20 for Friday and Saturday sessions, and there will also be lots of food and music to keep you going. See you there! "Since its inception, CBR has built a solid reputation as the launchpad for exciting new brews and innovations in the brewing industry. Beer fans travel from afar to taste the beers, check out product launches and for the rare chance to meet the faces behind the brands. 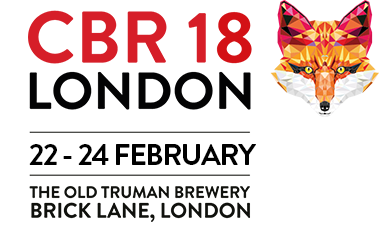 This year 175 breweries will exhibit at CBR with well-established beer brands such as Meantime, Sierra Nevada and Oakham Ales sitting alongside local rising stars like Gipsy Hill, Brixton Breweryand Mondo. Exciting new additions for 2018 include Lost + Found A.BL, Unity Brewing Co and Fierce Beer amongst others, while brews like Orchard Pig, Thistly Cross Cider and Sheppys represent the Cider world. This balance between independents and established breweries is what sets CBR apart in an otherwise crowded beer festival market. In order to keep guests well fuelled and energised, mouthwatering food is on offer from a selection of London based street food traders. Kolkati will be bring India to London with their knock-out hot kati rolls while Prairie Fire BBQ, London's only traditional Kansas City BBQ, will serve up grilled meats. Le Bao offer taiwanese steamed buns such as their award winning pork belly and crispy chicken while Sheffield’s ‘dipped pork BBQ & gravy shack’ Salty Loins also join the fun amongst others. A selection of beer snack outfits will also be in the food hall with The Curators selling a range of mouth-watering jerky and** Serious Pig** offering classics like snacking salami and oven-roast pork crackling. Established in 1797, cheese experts Paxton & Whitfield will have a selection of cheese boards on offer to cater for the growing trend of people pairing cheese with beers. Vegans, listen up! It’s not all meat and cheese and CBR will have a selection of Vegan street food as well as a large selection of vegan friendly brews."